Crucial has launched the MX500, the current spearhead of the MX series. Even the predecessors enjoyed great popularity as inexpensive and powerful SSDs. The new MX500, with its dynamic write acceleration and high guaranteed write volume, is also expected to compete with the Samsung SSDs again. The BX300 continues to play the role of the entry-level SSD, which excels in terms of price/performance. There is currently no successor model available for the BX series. But what exactly is the difference between the Crucial MX500 / BX300? And which of these SSDs is recommended for my personal use? Behind the Crucial brand is the chip manufacturer Micron. Crucial is therefore one of the SSD manufacturers, along with Samsung, that produce the flash memory for their SSDs themselves. This of course has decisive advantages in terms of quality assurance and pricing. With the MX500, Crucial relies on layered memory cells (3D-NAND) in the second TLC generation with 64 layers. Thanks to the three-dimensional design, one chip now provides 256 Gigabit storage capacity. This triple-level cell flash (TLC) can store 3 bits per cell, making it cheaper than MLC memory (with only 2 bits per cell). At the same time, however, it is also somewhat slower. In terms of memory, it is surprising that Crucial uses the higher quality MLC-3D-NAND on the BX300, which Crucial calls the entry-level SSD. To ensure that the performance of the MX500 does not suffer due to the TLC flash, Crucial uses an SLC cache, called Dynamic Write Acceleration by Crucial. For clever cell management, Crucial has switched the SSD controller from Marvell’s 88SS1074 to Silicon Motion’s SM2258 with four memory channels. With regard to the 860 series from Samsung, the MX500 achieves comparable read/write rates for everyday tasks. The MX500, as well as the BX300, however, are significantly behind the current Samsung models in terms of promised service life. Crucial would particularly like to score with the MX500 with its durability. For example, the manufacturer states a TBW value of 80 TB for the 250 GB model, which corresponds to around 73 GB of written data per day within the 3-year manufacturer’s warranty. With the 500 GB model, the figure of 160 TBW is twice as high. 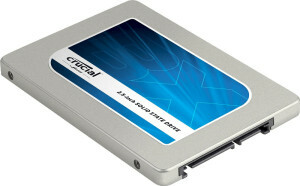 Crucial’s 2000 GB model with a TBW value of 700 TB, i.e. around 380 GB of written data per day, is at its peak. The warranty period is now 5 years, which according to Micron should inspire confidence in the more durable second-generation 3D NAND. On the BX300 Crucial does without a 1 TB model, which still existed on the predecessor (BX200). Although Crucial places the BX family as an entry-level SSD series next to the faster and more expensive MX models, the BX300 uses the higher quality memory – which is surprising. While the MX500 is equipped with TLC-3D-NAND, the BX300 uses the more expensive, faster and more durable MLC-3D-NAND with 32 layers and two bits per memory cell. Although these are first-generation MCL-3D-NADNs, the former classification has nevertheless become absurd and the border between BX and MX is disappearing. This is also demonstrated by the fact that the BX300 has almost identical read and write rates as the MX500. Both the BX300 and its big brother MX500, the Silicon Motion SM2258 with 4 channels, are used as controllers. An SLC cache is used for write acceleration, in which a part of the MLC NAND flash is addressed in the faster SLC mode. According to the manufacturer, the BX300 achieves a writing power of 55 TBW (120GB model), 80 TBW (240GB model or 160 TBW (480GB model). This means that the TBW value of the BX300 is in a similar range to that of the Samsung 850 EVO. 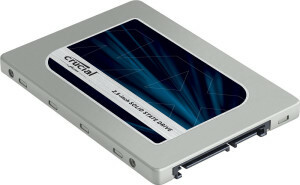 Crucial gives a 3 year warranty on the BX300 as usual for mainstream SSDs. This is one of the few points where the MX500 is inferior. In the home user area, experience has shown that it still survives the period of use of most PCs.